Government Resources - Planet Aid, Inc. Private clothing donation bins are helping municipalities lower the cost of waste disposal by providing consumers with a convenient way to recycle unwanted textiles. But bins do much more than this, and can even help mobilize social thought and action. Planet Aid applauds local efforts to make recycling available to the public, and we offer our support to help make sure that consumers have a way to conveniently recycle their textiles without any hassles or drawbacks. 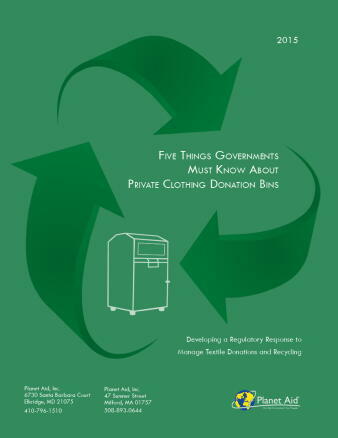 We encourage government representatives and others to download our white paper: Five Things Local Governments Must Know About Private Clothing Donation Bins by clicking on the cover to the right. Click here to download a copy of a model ordinance to regulate textile recycling bins. Cooley, A. (2013). Going Public, Resource-Recycling. Ando, A.W., & Gosselin, A.Y. (2005). Recycling in multifamily dwellings: does convenience matter? Economic Inquiry, 43(2), 426-438. Barr, S., & Gilg, A. (2005). Conceptualising and analyzing household attitudes and actions to a growing environmental problem: Development and application of a framework to guide local waste policy. Applied Geography, 25, 226-247. Birkner, A., Celusnak, K., Nutini, G., Rycenga, J., Winter, H., & Wood-Nartker, J. (2010). Predicted recycling bin usage in apartment complexes. Undergraduate Research Journal for the Human Sciences, 9. Domina, T., & Kock, K. (2001). Textile recycling, convenience, and the older adult. Journal of Family and Consumer Sciences, 93(5), 35-40. Largo-Wright, E., Johnston, D.D., & Wight, J. (2013). The efficacy of a theory-based, participatory recycling intervention on a college campus. Journal of Environmental Health, 76(4), 26-31. Martin, M., Williams, I.D., & Clark, M. (2006). Social, cultural and structural influences on household waste recycling: A case study. Resource Conversation and Recycling, 48(4), 357-395. Sekito, T., Prayogo, T.B., Yoshitake, T., & Bagus, I. (2013). Influence of a community –based waste management system on people’s behavior and waste reduction. Resources, Conservation and Recycling, 72, 84-90. Sidique, S.F., Lupi, L., & Joshi, S. V. (2010). Effects of behavior and attitudes on drop-off recycling activities. Resource Conservation and Recycling, 15(3), 163-170. U.S. Government Accountability Office. (2006). Recycling: Additional efforts could increase municipal recycling (GAO-07-37). Washington, DC: U.S. Government Accountability Office. Wagner, T.P. (2013). Examining the concept of convenient collection: An application to extended producer responsibility and product stewardship frameworks. Waste Management, 33(3), 499-507. Lu, J., & Hamouda, H. (2014). Current status of fiber waste recycling and its future. Advanced Materials Research, 878, 122-131. Muthu, S.S., Li, Y., Hu, J.Y., & Mok, P.Y. (2103). Modelling and quantification of Eco-functional Index: the concept and applications of eco-functional assessment. Ecological Indicators, 26, 33-43. Muthu, S.S., Li, Y., Hu, J.Y., & Mok, P.Y. (2012). Quantification of environmental impact and ecological sustainability for textile fibres. Ecological Indicators, 13, 66-74. Muthu, S.S., Li, Y., Hu, J.Y., & Mok, P.Y. (2012). Recyclability Index (RPI): The concept and quantification of textile fibres. Ecological Indicators, 18, 58-62. Zaffalon, V. (2010). Climate change, carbon mitigation and textiles. Textile World, 160(4), 34-35. Intergovernmental Panel on Climate Change. (2014). Climate change 2014: Impacts, adaptation, and vulnerability. Berlin, Germany: Field, C., Barros, V., Mach, K., Mastrandrea, M., van Alst, M., Adger, N., … Yohe, G.W. Intergovernmental Panel on Climate Change. (2014). Climate change 2014: Mitigation of climate change technical summary. Berlin, Germany: Edenhofer, O., Pichs-Madruga, R., Sokona, Y., Kadner, S., Minx, J., Brunner, S., …Quadrelli, R.
U.S. Global Change Research Program. (2014) Climate change impacts in the United States: The third national climate assessment. Washington D.C.: Melillo, J. M., Richmond, T.C., & Yohe, G.W. (Eds.). doi:10.7930/J0Z31WJ2.